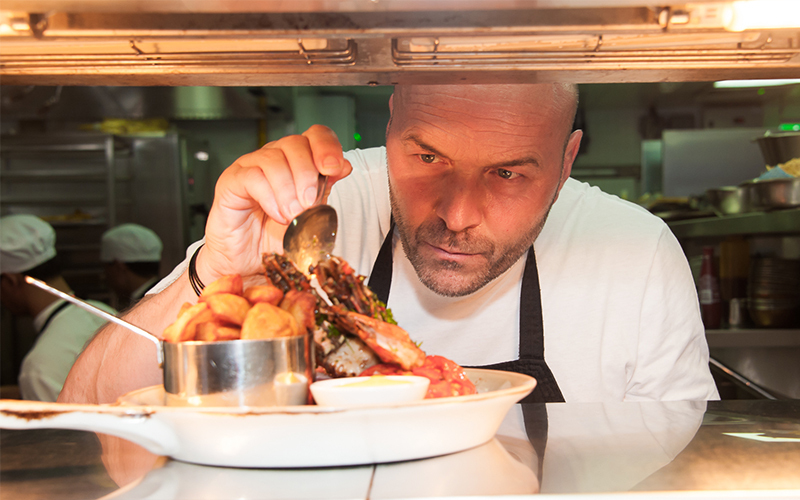 Simon Rimmer is jetting over to the UAE to get involved in Taste of Dubai this weekend, where he’ll be demonstrating how to make some of his favourite dishes to eager foodies at the festival. Along with testing out Dubai’s cooking skills with The Scene’s very own Head Chef Garth de Villiers, no Dubai trip would be complete without making a visit to his first Pier 7, where he’ll be hosting daily specials, along with entertaining the guests in the evening from March 5th – 8th. Simon has been busy in recent months in the UAE. Alongside overseeing operations at The Scene at Pier 7, Dubai Marina, he opened a second restaurant at Yas Island, Abu Dhabi – sharing the same name as its Dubai sister. But firmly stationed in Dubai this weekend, Simon will be putting on a demonstration at The Crate & Barrel Chef’s Theatre hosted by Jo Pickard on Thursday 8th March, with some lucky winners being given the chance to sit at the Tasting Table to try the dishes that have been prepared at the end of the demonstration. On Friday, Simon will be joining forces with The Scene’s head chef Garth de Villiers to put Dubai’s cooking skills to the test at The Al Ain Dairy & Kibsons Cooking Challenge, with the best dish be awarded a special prize at the end of each round. For more details on the events taking place at Taste of Dubai, visit the website.